Location : Approximately 30 km from Marrakech, and spreading between the first foothills of the Atlas Mountains, the Ourika Valley is one of the most beautiful and best preserved valleys in Morocco. The region is without a doubt the perfect tourist destination for people who seek a Moroccan adventure, discovery, relaxation, and meditation. The Ourika Valley has a wealth of sights to see and places to visit. 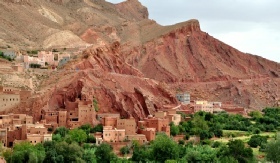 There is the Ourika Valley itself with its beautiful river, berber villages, and waterfalls. The highlighit of the trip is visiting typical Berber house. The house used to belong to an important noble man and has been restored to its original state by its passionate owner. The traditions and customs of Berbers can be admired throughout the rooms and hallways where the different objects and furniture intertwine with photos of the Berbers, some of them taken as early as 1900's. If you haven't yet caught your breath from the walk up to the house, the dramatic panorama of the Ourika Valley can be admired from the roof terrace while sipping a tea that will be prepared by the mother.Then you cross ourika valley till we reach the beautiful village of Setii Fatma which is famous for its seven waterfalls. Here we will start a gentle walk to reach the waterfalls. Lunch will be by the Ourika river . On the way back to Marrakech small villages with their mud- brick adobe- red houses greet your eye sight, stacked into the hillside or lining the water course shaded by the palm grove.